Consumer trust in big corporations has eroded in recent years and increasingly&comma; consumers are choosing to spend their money locally and with businesses that share their values. But sussing out true social and environmental practices from PR propaganda isn't always easy for consumers&comma; which is why some businesses are investing time and resources to earn B Corp certification. In fact&comma; eight NH companies have become part of this international movement that promotes doing well in business by doing good in the world. MegaFood in Derry is the most recent NH company to join W.S. Badger&comma; Homefree&comma; Pete and Gerry's Organics&comma; ReVision Energy&comma; Stonyfield Farm&comma; Mascoma Bank and Green Energy Options in achieving “B Corp” certification by the nonprofit B Lab. To achieve the certification&comma; companies must meet rigorous standards of social and environmental performance&comma; accountability and transparency. They are part of a larger movement of more than 2&comma;400 certified B Corps from 50 countries across 130 industries. Some people confuse B Corp certification as being interchangeable with being a benefit corporation&comma; which&comma; while related&comma; are not the same designations. 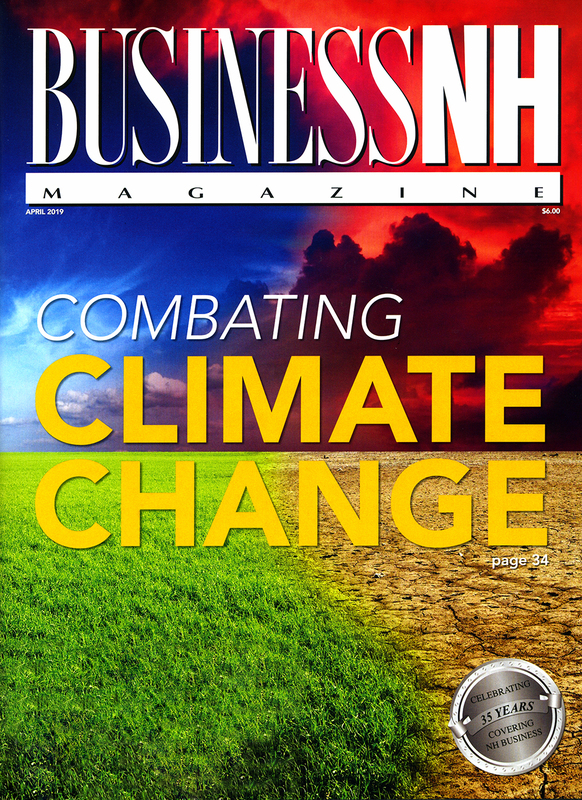 Choosing to be a benefit corporation is a legal way for NH companies to say&comma; “we are looking to do more than just create profit&comma; and we want our employees and customers to know&comma;” says Michelle Veasey&comma; executive director of NH Businesses for Social Responsibility . While corporations in general put profits and shareholders first&comma; a benefit corporation is allowed to put mission on an equal footing with making money. 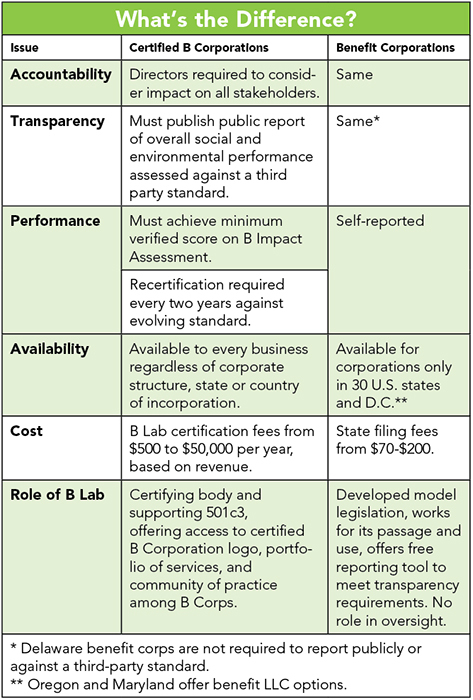 Veasey says a benefit corporation is supposed to provide third-party proof of performance&comma; and some are choosing to do so through B Lab. B Corp certification demonstrates a company meets rigorous standards by scoring at least 80 of a possible 200 points on an assessment covering four impact areas: governance&comma; workers&comma; community and environment. However&comma; any business can pursue B Corp certification. They do not have to be registered benefit corporations. At W.S. Badger&comma; Rebecca Hamilton&comma; vice president of R&D and regulatory&comma; says the company has always been mission driven. W.S. Badger played a key role in changing NH law to allow business to change their articles of incorporation to become benefit corporations. At the time W.S. Badger earned its B Corp certification in 2011&comma; NH did not allow companies to rewrite their articles of incorporation. “So your sole purpose had to be to maximize earnings and return profits to shareholders&comma;” Hamilton says. Badger leadership went to their state senator at that time&comma; Molly Kelly&comma; and asked her to work with them to get the legislation passed so they and other B Corps could include mission in their articles of incorporation. “Not only does it allow us to have articles of incorporation that are more representative of our business&comma; but it also means we are legally protected to put our mission on equal footing with our fiduciary duty&comma;” Hamilton says. For Valerie Piedmont&comma; co-owner of Green Energy Options&comma; the road to B Corp certification was long. She says she started the impact assessment in 2013&comma; but as a small business owner&comma; her time was limited&comma; and the project languished. In 2017 she hired a business consultant to work on strategic and succession plans&comma; and the consultant told her that if she was working on B Corp certification it would cover all the things she needed to be a business in good standing. “You submit your assessment&comma; and you get more questions to narrow down the focus&comma;” Piedmont says. Part of the assessment looks at whether a business serves the local area; and although all but 50 of their client list of 800 were inside the 50-mile radius&comma; their records did not contain enough detail to prove it. Enter Taryn Fisher&comma; a member of the faculty at Antioch University in Keene and the program director for the MBA in sustainability. Fisher organized a B Corp panel discussion at the Hannah Grimes Center for Entrepreneurship in Keene. Fisher is a member of the global B Corp academic community of more than 300 universities around the world looking to accelerate the growth of the B Corp movement. “The B Corp movement is a big part of our curriculum&comma;” Fisher says. Fisher has a group of students who will spend six weeks helping Green Energy Options develop an impact improvement plan based on its B impact assessment report. For the state’s eight B Corps&comma; the values represented in the B Corp movement—“to be the change they seek in the world and conduct business as if people and place mattered”—are closely aligned to their own. Paul Turbeville&comma; vice president of marketing for Pete and Gerry’s&comma; says when the company decided to pursue B Corp certification in 2012&comma; to a large extent it was taking credit for what it was already doing. “We were already taking great care of our farmers&comma; the environment&comma; our employees and the hens who we see as part of our employee network&comma;” Turbeville says. The ability to institutionalize mission and values also motivated Mascoma Bank. “We are a mutually-owned bank&comma; with no stockholders&comma; so our commitment to the community has always been very strong. The leap to B certification was a natural one&comma;” says Samantha Pause&comma; chief marketing officer. Jill Robbins&comma; founder of Homefree&comma; says her company culture fit the B Corp model&comma; so it made sense to pursue and to support the ideas behind certification. Robbins says Homefree cookies and treats are produced in a baking facility with allergy safety in mind. As a mother of a child with allergies&comma; she appreciates the level of trust the certification implies and hopes people will come to value the effort it takes. Robbins says she liked that the assessment asked so much of a company&comma; so even if a company was not doing a certain initiative yet&comma; it could consider it for the future. “In that way&comma; it provides a guide to keep exceeding what you do already&comma;” Robbins says.